Admost SDK is a client side tool which does not have any relation with DFP Ad Server on the server side, so there is no need to implement any integration via an adapter. Admost’s main target is to optimise the backfill inventory via several ad networks. So clients will continue using DFP as usual for premium sales or first look campaigns. 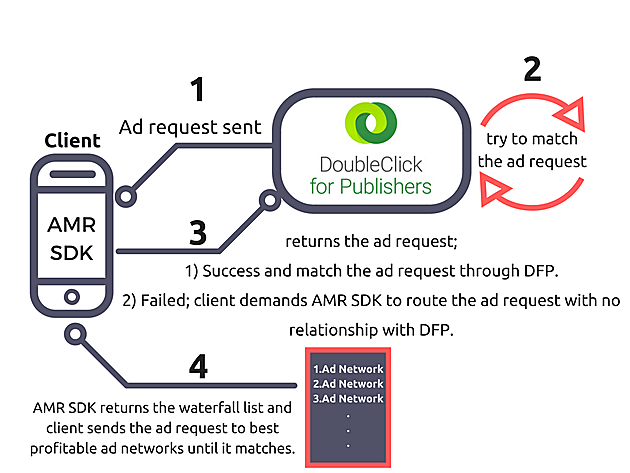 If DFP can not match the client’s request, the client identifies Admost SDK to call which ad network to send the ad requests in order of waterfall algorithm. If the ad request is matched, DFP Server returns success and the ads back to the client. And the process is finished. If the ad request do not be matched, DFP Server returns fail to the client. And the client demands from Admost SDK embedded into the application to find the route of the ad request. Admost SDK returns the waterfall list of ad networks per country and per placements and the client made the request to each ad network in order until the ad requests matched. Check out Admost’s easy setup SDK documentation.